The Olympus 35 RD is a rangefinder camera with automatic and manual exposure modes. 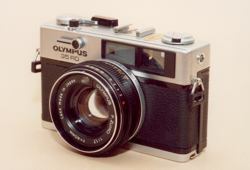 First introduced in 1975, the Olympus 35 RD keeps most of the characteristics of its big brother, the Olympus 35 SP. A fast 42mm f/1.7 Zuiko lens (6 elements instead of 7 for the SP), an automatic or fully manual exposure and a very bright viewfinder and rangefinder are packed in a compact and light body. The 35 RD has the same "flashmatic" mechanical flash auto-exposure system as the SP but lacks the SP's spot mode. Smaller than the SP, it is a very pleasant though hard to find camera. The Olympus 35 RD is easy to use. The viewfinder is exceptionnally bright and has a collimated frame with parallax indication marks. The film advance is silk-smooth. In auto mode, one has just to set the speed and the camera takes care of the diaphragm. The actual aperture is shown by a needle in the viewfinder. The auto mode automatically blocks the shutter release if the picture is over or under exposed, a rather annoying feature. The light meter being on the lens assembly, it compensates automatically for filters. It only turns off in complete darkness, so a lens cap is mandatory. The manual mode gives control of the diaphragm as well with indication in the viewfinder but the setting ring, located at the bottom of the lens assembly, is hard to turn. The light meter is then turned off and one has to jump between modes to have light metering indications.